One of the items on our menu for dinner tonight is pork chops. Like many people I like my pork chops fried and served with or without a nice basic and favored corn starch sauce. However, I am also a great fan of deep frying. Yet at the time I started deep frying there were no recipe for frying pork chops in a deep fryer. So using the good old trial by error method I came up with a recipe for just this purpose. A note on using and purchasing deep fryers, I highly suggest purchasing a large deep fryer and not the smaller one. These fryers are good for college kids and single persons, but for your average size family or persons like me who loves tossing together different food items to create, make, and bake delicious meals. The smaller ones are attractive and cost as low as $20.00. However, it is the larger deep fryers that will be the greater value in terms of cost, durability and longevity over time. There are many brands, such as Hamilton Beach Professional-Style Deep Fryer, Aroma Smart Fry XL 4-Quart Digital Dual-Basket Deep Fryer, and Presto Stainless Steel Dual Basket Pro Fry Immersion Element Deep Fryer just to name a few. 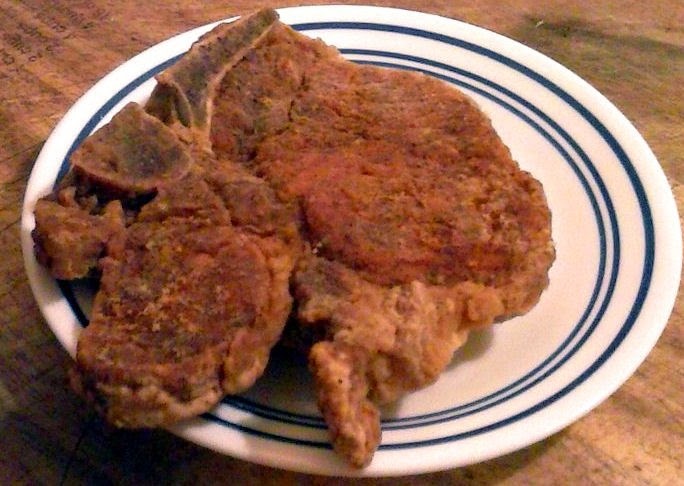 Frying pork chop in a deep fryer can be as easy as frying chicken wings. All you need to know is the right temperature setting and the amount of minutes that will turn out deep fried pork chop that are crispy on the outside and flavorful and moist on the inside. Add seasoned salt, garlic power, onion power, black pepper and cayenne pepper to a small shaker. An empty season shaker will work will. Rinse and pat dry pork chops. Sprinkle both sides of meat with the seasonings and peppers in the shaker. Add flour to a gallon size plastic zip lock bag. Add pork chops to bag. Zip it and shakes pork chop until completely covered. When deep fryer beeps, add pork chops. Remove meat after 8 1/2 minutes Pork chops should be crispy and golden in color on the outside, while white, moist, and tender on the inside. At the same time do not overcook or meat will be dry and tough.